Some new p-quinones were prepared by reacting the compound 2,3,5,6- tetrabromo-benzoquinones with p-aminoacetophenone. The resulted compounds were cyclized with hydroxylamine to furnish the required compounds .The structures of the prepared compounds were elucidated spectroscopically through IR, 1HNMR, and MS. These compounds were screened for their antibacterial activities against four standard bacterial organisms. p-aminoacetophenone, p-quinones, Aromatic aldehydes, Antibacterial. Quinones are powerful intermediates for organic synthesis, because they possess both reactive carbonyl and olefinic bonds and occur frequently within structures of natural products . The synthesis of quinones is important in organic chemistry because they are not only useful intermediates, but also many are pharamucologically active compounds . They are Micheal acceptors and represent a class of toxicological intermediates which can create a varity of hazardous effects i.e. acute cytotoxicity, immunotoxicity, and carcinogenesis . Quinones, by their antioxidant activity, improve general health conditions. Many of the drugs clinically approved or still in clinical trials against cancer were quinones related compounds. They are fast redox cycling molecules and have the potential to bind to thiol, amine and hydroxyl groups [3,4]. p-quinones compounds which are containing both electron withdrawing and donating substituents proved to be effective and give products in good yields [5,6].They were known to possess antitumor activity, antimicrobial activity and antimalarial activity . In this work, p-quinones were synthesized by the reaction of bromanil with p- amino acetophenone to give product which was treated with different aromatic aldehydes in presence of ethanolic NaOH. The produced compounds were cyclised with hydroxylamine to furnish the p- quinones derivatives that can be used in the search for better antimalarial, antitumor, and antimicrobial drugs. Melting points were uncorrected and were recorded on melting point apparatus (Gallenkmp, England) by using open capillary tube. IR spectra were recorded on FTIR spectrometer (Perkin Elmer model 8400s) using KBr disc method. 1HNMR were recorded on (Brucker AMX 400 MHZ) spectrometer in DMSO as solvent and TMS as internal standard. Mass spectra were recorded on shimadzu QP-2010 Plus spectrometer at 70 eV. 0.003 mole of Bromanil and 0.002 mole of p-aminoacetophenone were dissolved in 10 ml of ethanol, 10 ml of glacial acetic acid, 2 ml of water and 0.1 g of sodium acetate was added. The mixture was refluxed for 3 hours. Then it was poured into ice-water. 10% of HCl drops was added, and stirred until the precipitate was formed. The precipitate was filtered, washed and recrystallized from ethanol. The completion of the reaction was monitored by TLC (Figure 1). Figure 1: Chemical structures of 2, 5-dibromo- 3, 6- diamino- 1, 4- diones. 0.001 mole of compound (I) and 0.002 mole of Benzylaldehyde, furfural, salicyaldehyde, anisaldehyde were dissolved respectively in 20 ml ethanol. Sodium Hydroxide solution (2M) was added slowly and the mixture was stirred for 24 hours. Then it was poured into ice-water, 10% of HCl drops was added, and stirred until the precipitate was formed. The precipitate was filtered, washed and recrystallized from ethanol. The completion of the reaction was monitored by TLC . 0.001 mole of the α ,β unsaturated carbonyl compounds derivatives of (IIa, IIb, IIc,IId) and 0.002 mole of hydroxylamine and sodium acetate 0.1 g were dissolved in 20 ml ethanol and refluxed for 6 hours.The mixture was poured into ice-water and stirred using the glass rod until the precipitate was formed. The precipitate was filtered, washed and recrystallized from ethanol. The completion of the reaction was monitored by TLC. Yield 67.3%, m.p 220°C-221°C, Rf value 0.72, mobile phase ratio chloroform 9.8:0.2 methanol. IR=1627.81 cm-1, 1521.73 cm-1, 1579.68 cm-1, 3095.54 cm-1, 748.33 cm-1, 3404.13 cm-1. 1HNMR 2.08 ppm (s, 6H-2CH3), 7.57-7.89 ppm (m, 8Ar-H), 2.49-2.50 ppm (s, 2H-2NH). Yield 69.5%, m.p 241°C-242°C, Rf value 0.84, mobile phase ratio chloroform 9.9: 0.1 methanol. IR 1672.17 cm-1,1508.23 cm-1,13338.86 cm-1, 3336.62 cm-1, 703.97 cm-1, 3735.86 cm-1, 867.91 cm-1.1HNMR ,7.22-7.47 ppm (m, 8ArH),4.76 ppm (s,2H-2NH). Yield 54.3%, m.p. 238°C-239°C, Rf value 0.88, mobile phase ratio chloroform 9.9:0.1methanol. IR 1679.88 cm-1,1554.88 cm-1, 13338.51 cm-1, 3311.35 cm-1, 703.97 cm-1, 3735.86 cm-1, 867.19 cm-1. 1HNMR, 6.89 ppm (d, 6Ar-H) 2 furan, 4.76 ppm(s, 2H-2NH). Yield 51.2%, m.p.258°C-259°C, Rf value 0.87, mobile phase ratio chloroform 9.9:0.1 methanol. IR 1645.17 cm-1, 1539.09 cm-1, 1419.51 cm-1, 3336.62 cm-1, 852.48 cm-1.1HNMR,7.93 ppm (m,10Ar-H),4.15-4.40 (s,6H,2OCH3),3.79-3.82 ppm (s-2H-2H). Yield 63.4%, m.p.253°C -254°C, Rf value 0.81, mobile phase ratio chloroform 9.9:0.1 methanol. IR 1647.10 cm-1, 1541.02 cm-1, 1326.93 cm-1 , 3419.56 cm-1, 572.19 cm-1, 3853.1 cm-1, 3286.48 cm-1, 823.56 cm-1. 1HNMR, 7.89-7.93 ppm (m, 10Ar-H), 2.55 ppm(s, 2H-2OH), 4.76 ppm(s, 2H-2NH). Yield 54.7% m.p.298°C-299°C.Rf value 0.93, Mobile phase ratio chloroform 9.9:0.1 methanol. IR 1672.17 cm-1,1564.16 cm-1, 13338.51 cm-1, 1338.51 cm-1, 703.97 cm-1 , 3348.19 cm-1, 3735.60 cm-1, 867.81 cm-1. 1HNMR 7.89- 7.91 ppm (m- 8Ar-H), 7.11ppm (s, 1H, isoxazole), 2.54 ppm (s, 1H, NH). Yield 40.3%, m.p.279°C-280°C, Rf value 0.38, mobile phase ratio chloroform 9.9:0.1 methanol. IR 1679.88 cm-1, 1544.88 cm-1, 1338.51 cm-1, 3311.55 cm-1, 703.97 cm-1, 3735.60 cm-1, 867.91 cm-1. 1HNMR 7.18 ppm (d,1-H furan ), 7.35-7.52 ppm (m,8Ar-H), 6.14ppm (s, 1H,isoxazole), 2.50 ppm (s, 1H,NH). Yield 43.5%, m.p. 290°C -291°C, Rf value 0.92. Mobile phase ratio chloroform 9.9:0.1 methanol. IR 1672.17 cm-1, 1541.02 cm-1, 1338.51 cm-1, 3348.19 cm-1, 703.97 cm-1, 3749.36 cm-1, 807.91 cm-1. 1HNMR 7.20-7.80 ppm (m, 8Ar- H), 2.08 ppm (s, 3H-OCH3), 6.55 ppm (s, 1H-isoxazole), 2.50 ppm (s, 1H-NH). Yield 62.8%, m.p.287°C -288°C.Rf value 0.84, mobile phase ratio chloroform 9.9:0.1 methanol. IR 1672.17 cm-1, 1544.88 cm-1, 1338.51 cm-1, 3336.62 cm-1, 703.97 cm-1, 3751.29 cm-1, 867.91 cm-1.1HNMR 2.51 ppm (s-1H-OH), 7.20-7.80 ppm (m-8Ar-H), 6.80 ppm(s,1H-isoxazole), 2.06 ppm (s-1H,NH). The target compounds were screened for their antimicrobial activity using a disc diffusion method. The disc diffusion method was used to screen the antibacterial activity of some para-quinones derivatives compounds and performed by using Mueller Hinton agar (MHA).The experiment was carried out according to the National Committee for clinical Laboratory Standards Guidelines [NCCLS, 1990]. Bacterial suspension was diluted with sterile physiological solution to 108. Cfu/ml (turbidity=McFarland Standard 0.5). One hundred microliters of bacterial suspension were swabbed uniformly on surface of MHA and the inoculums was allowed to dry for 5 minutes. Sterilized filter paper discs were placed on the surface of the MHA and soaked with 20 μl of the solution of each compound. The inoculated plates were incubated at 37°C for 24 hour in the inverted position. The diameters (mm) of the inhibition zones were measured. The average of the diameters of the growth inhibition zones are shown in the table below. The results were interpreted in terms of the commonly used terms (sensitive, intermediate and assistant. Table 1: Antibacterial activity of synthesized compound. 12-18 mm growth inhibition zones is considered to be active, more than 18 mm is very active, values 9-12 are partially active, values less than 9 mm is less reactive. It was observed in the above Table 1, the comparison between the synthesized compounds, that the electron-donating effect of the amino group decreases the biological effect probably by lowering the oxidant capacity of the p-quinones system. M.D.I.Z: diameter or growth inhibition zone (mm). In this work the target molecules i.e. the p- quinones which lost their aromaticity. They undergo nucleophilic subsitution reaction with the nucleophile (the amino group) because of the liability of bromine. Reaction of the intermediate 2,3,5,6-tetrabromo-1,4-Benzoquinone with p- aminoacrtophenone lead to the formation of compound (I) which was treated with the aromatic aldehydes (benzaldehyde,furfural, salicyaldehyde, anisaldehyde) respectively in ethanolic NaOH at room temperature gave the compounds (II-V). These compounds upon cyclization with hydroxylamine hydrochloride in presence of sodium acetate and ethanol lead to the formation of the crossponding p- quinones derivatives (VI-IX). The synthesized compounds were purified by recrystallization from ethanol, and their purity was checked by melting point and TLC. They were spectroscopically elucidated through IR, 1HNMR,and Ms.
1HNMR spectra of the intermediate compound (1) showed 6-H protons as singlet in the region 2.08-2.55 ppm due to the two methyl groups, compounds II-V showed a sharp signal of 1-H proton at range 3.79-4.76 ppm due to the deshielding that can be rationalized on the basis of the lone pair of nitrogen atom.The aromatic protons appeared at 7.22-8.06 ppm. The 1HNMR of the p- quinones derivatives (VI-IX) showed the aromatic protons as a multiplied in the range 7.22-7.89 ppm. The isoxazole of these products was displayed as a singlet signal of one proton at 6.14-7.11 ppm due to the proton of isoxazole ring. A singlet signal also appeared at 2.50 ppm due to the lone pair effect of the nitrogen atom. In conclusion, it was recommended to examine the newly synthesized compounds i.e. (p- quinones derivatives) against the wide spread diseases such as malaria cancer, etc., because they act as potential anticancer, antimalarial agents. Hirofumi T., et al., Tetrahedron Letters, 2001. 42: p. 6899-6902. Judyl B., et al., Chemical Research in Toxicology, 2000. 13: p. 135-160. Kalirajan, R., et al., International Journal of Chem. Tech Research, 2009. 1: p. 27-34. 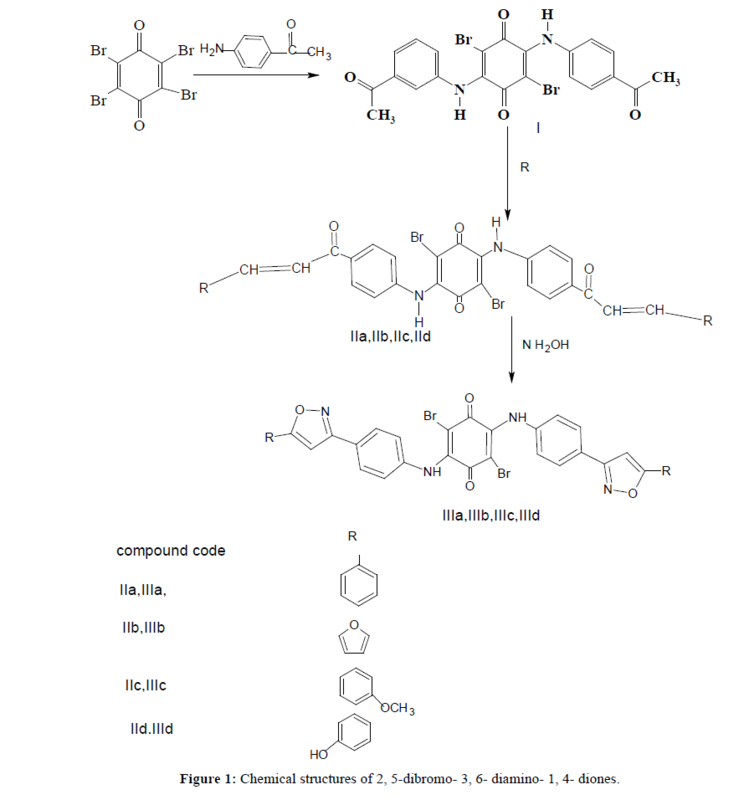 Nahed, E.l.N., et al., Phytochemistry Reviews, 2011. 10: p. 353. Saeed, A.E.M., et al. African Journal of Pure and Applied Chemistry, 2009. 3: p. 275-280.